The clouds and cold remained with us here in Churchill as temperatures were around 18°F. The Olympic torch is barreling through the North toward Churchill. 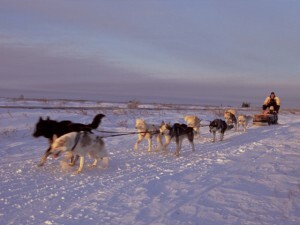 Yesterday it went through Old Crow, Yukon by dogsled and will head to Inuvik before making it to Churchill on Sunday. This day marked 100 days until the Vancouver Olympic Games commence. On the tundra it was another incredible day with the Bears and other wildlife. Guide Paul was around the lodge in the morning and his travelers witnessed three males sparring in the early morning sun. The three would alternate the ritual dance with each other thrilling all the onlookers from a few different Natural Habitat groups. At least six or seven bears were in the area and Ptarmigan scurried in and out of the willows as bears approached. As the morning continued, many bears were on and around the vehicles in locations near Gordon point. Later in the day a Red Fox was spotted on Christmas Lake Esker catching Voles and lemmings and eating them. Then as the afternoon was turning to dusk, Paul’s group witnessed a majestic mom and cub moving across a large pond. A large Arctic Hare moved slowly five feet from the back deck of the rover with cameras snapping away. Great day in the CWMA!